The last few weeks has been a crazy ride for me, especially the last few days. I was and still am surrounded by paranoia and confusion. Good news kept on coming last week. Firstly was the positive pregnancy test and the follow up check up with the doctor to confirm my pregnancy. I was extremely happy to find out that I'm finally having a baby, a child I can call my own. Mac and I had a pretty rough past months and this wonderful news will once again unite us. He's very happy too and so we started planning for the future, whether we will move to a bigger flat, what will be his or her name, dreams for the future. We never had that for a long time! On the other hand, I was also issued an emergency passport finally (after spending quite a lot, doubles the price of a normal passport) so that I can proceed to travel to China for my familiarization trip. I even started to pack. I was so excited that I'm finally traveling again and this time I am going to be with my baby, I am not going to be alone. And then the last few days have been hell, I started bleeding like a normal menstruation that I needed to keep on coming back to the hospital that also can't give me the answer that I need: Is my baby going to be okay? They said they can only tell in another 2 weeks as it was still small and they can't detect any heartbeat at this stage yet. I am 5 weeks pregnant as they say. I went through an ultrasound and I saw our little seed in the monitor. The doctor said they cannot tell anything now. You can imagine how frustrating it can be. They also advise me not to travel and next thing I did is to cancel it. I just feel so bad, so so bad that I cannot stop crying last night. Questions poured down to me - why does it keeps on happening? Have I done something wrong in my life? I thought after the last 6 months of misery, I am finally going to have it all, all the things that I deserved, things I have worked hard on. Turns out life just won't let me get away with it. Until now, I just keep on bleeding, like really? I took a leave from work and the duration is uncertain yet, though I am already thinking of going back this Monday. After reading hundreds of articles online about pregnancy and miscarriage, I feel more depressed. 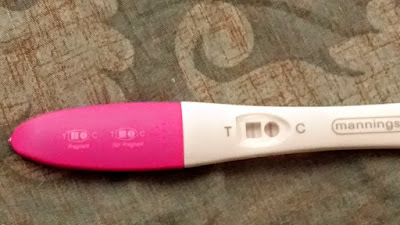 I decided to get another pregnancy test this morning and it turns out positive again. Of course it does not guarantee that my baby is okay as pregnancy tests only check if there's HCG in your system. Based on my research, if there's HCG present, then it concludes you're pregnant. At the moment, I am spending my hours in bed, just eat, sleep, and watch crime series online. I can only hope and pray for the best, I don't know how I'm going to make it through if I find out I had miscarriage. My husband has been very supportive and even took a day leave just to be with me, I'm still thankful. Simply the best quality preparing in UES. Educators won't give you a chance to escape with poor strategy or low weights - which are very uncommon. Went there around 20+ circumstances and exceedingly suggest. Little, clean, and inviting... also, you will get an extraordinary workout at babyinsider.net!